The Octopodiformes consists of a large group of living cephalopods, the Octopoda which contains over 200 species, the Vampyroteuthidae which contains a single species (a phylogenetic relict) and a large variety of extinct cephalopods in the Prototeuthidina and Loligosepiina. Information on the living and extinct forms are treated separately below. See separate sections on living and extinct Octopodiformes below. showing the absence of a buccal crown. True arms II modified as retractile filaments or absent. Horny rings in suckers absent. Functional arms IV united by web (absent in some argonautoids). Head fused to mantle dorsally. Superior buccal lobes adjacent (fused at edges) or completely fused to posterior buccal lobes. Inferior frontal lobe system of brain present or insepient. Lie outside of cephalic cartilage: dorsal to funnel (Vampyromorpha) or on stellate ganglia in mantle cavity (Octopoda). When present, with cartilagenous axial support (cartilage lost in subadult Vampyroteuthis). Shell a gladius, cartilage-like fin support, pair of stylets, or absent. Digestive gland duct appendages lie "outside" nephridial coelom. Drawing modified from Young, Vecchione and Donovan, 1999. Naef (1923) felt that the origin of the Octopoda would "forever be obscure." But Naef was unaware of the significance of Vampyroteuthis which was believed to be a cirrate octopod at the time. We now know that the Vampyromorpha is the sister group of the Octopoda and that Vampyroteuthis provides telling clues to the origin of the octopods. Young, et al. (1999) suggest two possible methods for this origin as illustrated here. In one (benthic route) the pelagic ancestor becomes benthic in a horizontal attitude (similar to the sepiolids today) and subsequently the arms and mouth rotate under the head. In the other alternative (pelagic route) the pelagic ancestor develops an "oral" orientation (i.e. laterally spread arms) here pictured with the oral end downward (as in octopods today) and subsequently becomes benthic with the oral end down. Evidence for the latter route is found in the structure of the brain. Octopods have a series of lobes in the brain, the inferior frontal lobe system, that is derived from the posterior buccal lobe. These lobes process complex chemotactile information from the arms. Vampyroteuthis has an "insipient" inferior frontal lobe system (J. Young, 1977). This bathypelagic animal apparently has a relatively advanced system for processing chemotactile information from the arms, one that surpasses that of shallow-living benthic decapods. Apparently Vampyroteuthis uses its arms in an unusual manner. Young, et al. 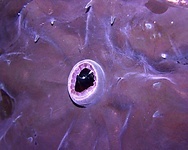 (1999) suggest that like its immediate ancestor (a "pre-octopod"), associates with pelagic jellyfish or tunicates and uses its arms and suckers to adhere to and/or explore the surfaces of these gelatinous animals. That is, it has an oral orientation for contact with surfaces. The pre-octopod, then was pre-adapted for settling on the ocean floor in an oral-end down configuration. This oral orientation enabled octopods to become the effective crawling animals that most are today. However the manner in which Vampyroteuthis actually uses its arms and its possible association with gelatinous animals has yet to be demonstrated. Young, et al. (1999) argue, therefore, that the benthic habitat was the primitive one within the Octopoda and that pelagic species, which comprise nine of the eleven octopod families, are secondarily pelagic. In the Cirrates, these authors point out the compaction of viscera, loss of jet propulsion, presence of a fully-formed inferior frontal lobe system, single oviduct, fusion of the head and mantle and reduction of the shell as evidence of a quasi-benthic ancestry. In the Incirrates, they point to the presence of corneas (or their remnants), extreme reduction of the shell, absence of fins and cirri, fully formed inferior frontal lobe system, probably stalked chorions and brooding as evidence of a fully-benthic ancestry. J. Z. Young (1989), on the basis of anatomical differences, removed the Cirrata from its traditional place in the Octopoda and put it in its own order, Cirroctopodida. Young and Vecchione (1996), however, using cladistic analyses demonstrated that the inclusion of the Cirrata and Incirrata in the Octopoda is justified. That is, the order Octopoda, including the suborders Cirrata and Incirrata is a monophyletic group. This conclusion was more recently strengthened by the inclusion of additional characters in the analyses (Young & Vecchione, 2002). A variety of names have been proposed for this group (e.g., Octobrachia, Fiorini, 1981; Octopodiformes, Berthold and Engeser, 1987; Vampyromorphoidea, Engeser and Bandel, 1988; Vampyropoda, Boletzky, 1992). Young, et al. (1999) concluded that Octopodiformes was the most appropriate. 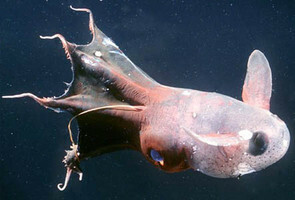 Vampyroteuthis infernalis, as the single living species of the Vampyromorpha, clearly indicates with its well-developed gladius that both the unpaired shell vestige of the Cirrata and the paired stylets of some Incirrata morphogenetically might have evolved from a gladius of an ancient group of Octopodiformes (Haas 2002, Bizikov 2004, Fuchs et al. 2009). Cephalopod gladii are well-known from the Mesozoic fossil record. In general, fossil gladii consist of an anteriorly diverging median field, hyperbolar zones and lateral fields (= “wings” or “vanes” in other terminologies). As can be observed from growth increments, fossil gladii grow isometrically. Compared to modern gladii, the median field of fossil gladii is thicker and wider (except in the families Muensterellidae and Palaeololiginidae that exhibit a rachis-like median field). Rostrum-like or septal-like structures as present in many modern gladii (see Toll 1998 or Bizikov 2008) are unknown in fossil gladii. Among fossil gladii, three different morphotypes can be recognized: a prototeuthidid, a loligosepiid and a teudopseid gladius. Whereas the relationships between the Prototeuthidina, the Loligosepiina, and the Teudospseina are still uncertain, the general gladius morphology within these three subgroups is remarkably uniform (in contrast to the extremely high morphological plasticity in modern gladii; see Toll 1998), i.e. only three main evolutionary pathways are distinct. Accordingly, newly discovered gladii can be easily ascribed to one of the three subgroups. The gladius is hence the most important systematic character complex, although preservation of soft tissues is very common in so-called Lagerstaetten (La Voulte-sur-Rhone, Solnhofen, Nusplingen, Hakel, Hadjoula). Soft-part characters such as the shape of the fins or the length of the arms revealed a high morphological variability even on the species-level. The diversity, taxonomy, morphology and phylogeny of Mesozoic gladius-bearing coleoids has been recently revised by Fuchs et al. (2003), Fuchs (2006 a, b, c, 2007, 2009, in press), Fuchs et al. (2007a, b, in press); Fuchs & Schultze (2008) and Fuchs & Weis (2008; 2009, in press). The Phragmoteuthida is a group of Triassic-Jurassic belemnoids with a breviconic phragmocone, relatively few chambers, a weakly developed guard, and a broad three-lobed proostracum (Jeletzky 1966, Donovan 2006). 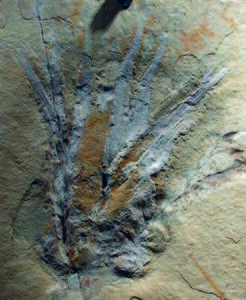 It is widely accepted that the ten-armed phragmoteuthidids are closely related to the Mesozoic gladius-bearing coleoids (Jeletzky 1966, Donovan 1977, Donovan & Toll 1988, Doyle et al. 1994, Fuchs 2006a). The loss of secreting calcareous shell material in a phragmoteuthidid subgroup would produce a purely organic structure that is almost identical with the gladius of early Jurassic loligosepiids. Since some gladii from different subgroups appear similar to those of living teuthoids, they have been long time grouped as “fossil teuthids”. However, this systematic position has been first doubted by Bandel & Leich (1986), because preserved arm crowns in association with gladii from the Late Jurassic Limestones of Solnhofen (Germany) never show more than eight arms. Earlier illustrations i.e. by Naef (1922), showing ten arms including a pair of ventrolateral tentacles have been proved to be wrong. Apart from this, the Loligosepiina exhibit a type of gladius that can be simply compared with Vampyroteuthis. Indeed, despite dozens of well preserved arm crowns of different species from different subgroups, different localities and different stratigraphic levels, an unambiguous pair of ventrolateral tentacle-like arms is still unknown from the fossil record (the presumed tentacle reported in Vecchione et al. 1999 is regarded as ambiguous; see Haas 2002 and Fuchs 2006a). Although the “Octopodiformes-Theory” has been meanwhile well-established (Engeser 1988, Haas 2002, Bizikov 2004, Fuchs 2006a), the systematic position of those gladius-bearing Mesozoic groups is nevertheless still under heavy debate. Supporters of the “Teuthoid-Theory” argue that the tentacles might have been lost before the dead squid touched the sea floor or that “fossil teuthids” would have lost their tentacles during life time as e.g. 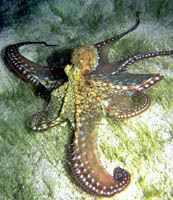 living Octopoteuthididae do. For supporters of the “Octopodiformes-Theory”, these arguments are not convincing, because among dozens of well-preserved arm crowns from various families there should be at least one specimen that preserved nine or ten arms (or at least a modified arm in ventrolateral position). Considering Mesozoic gladius-bearing coleoids as Octopodiformes means that unambiguous teuthoids are virtually unknown from the fossil record (with the exception of some teuthid-like statoliths from Cenozoic deposits). Bandel, K. & Leich, H. 1986. Jurassic Vampyromorpha (dibranchiate cephalopods). Neues Jahrbuch für Geologie und Paläontologie, Monatshefte 1986(3): 129-148. Berthold, T. and T. Engeser (1987). Phylogenetic analysis and systematization of the Cephalopoda (Mollusca). Verh. Naturwiss. Ver. Hamburg, 29: 187-220. Bizikov, V.A. 2004. The shell in Vampyropoda (Cephalopoda): morphology, functional role and evolution. Ruthenica supplement 3: 1-88. Bizikov, V.A. 2008. Evolution of the shell in cephalopoda. 447 p., Moscow (VNIRO Publishing). Boletzky, S. v. 1992. Evolutionary aspects of development, life style, and reproductive mode in incirrate octopods (Mollusca, Cephalopoda). Revue suisse Zool. 99(4):755-770. Donovan, D.T. 1977. Evolution of the dibranchiate Cephalopoda. Symposia of the Zoological Society of London 38: 15-48. Donovan, D.T. 2006. Phragmoteuthida (Cephalopoda: Coleoidea) from the Lower Jurassic of Dorset, England. Palaeontology 49(3): 673-684. Donovan, D.T. & Toll, R.B. 1988. 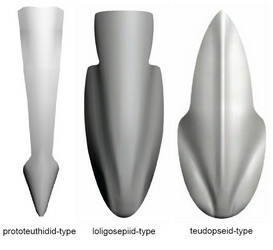 The gladius in Coleoid (Cephalopoda) Evolution : 89-101. In: Clarke, M.R. & Trueman, E.R., ed., The Mollusca. Palaeontology and Neontology of Cephalopods, San Diego (Academic Press). Doyle, P., Donovan, D.T., & Nixon, M. 1994. Phylogeny and systematics of the Coleoida. Paleontological contributions, University of Kansas 5: 1-15. Engeser, T. 1988. 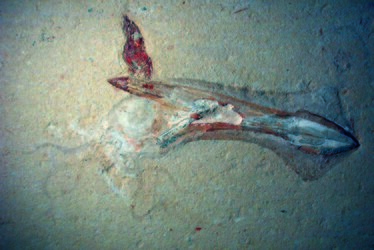 Vampyromorpha ("Fossile Teuthiden"). In: Westphal, F. ed., Fossilium Catalogus. I: Animalia: Pars 130. 167 p. Amsterdam (Kugler Publications). Fioroni, P. 1981. Die Sonderstellung der Sepioliden, ein Vergleich der Ordnungen der rezenten Cephalopoden. Zool. Jb. Syst., 108: 178-228. Fuchs, D. 2006a. Fossil erhaltungsfähige Merkmalskomplexe der Coleoidea (Cephalopoda) und ihre phylogenetische Bedeutung. Berliner Paläobiologische Abhandlungen 8: 1-115. Fuchs, D. 2006b. Diversity, Taxonomy and Morphology of vampyropod Coleoids (Cephalopoda) from the Upper Cretaceous of Lebanon. Memorie della Società Italiana di Scienze Naturali et del Museo Civico di Storia Naturale di Milano 34(II): 1-28. Fuchs, D. 2006c. Re-description of Doryanthes munsterii (D´Orbigny, 1845), a poorly known vampyropod coleoid (Cephalopoda) from the Late Jurassic Solnhofen Plattenkalks. Archaeopteryx 24: 79-88. Fuchs, D. 2007. Coleoid Cephalopods from the Plattenkalks of the Late Jurassic of Southern Germany and the Later Cretaceous of Lebanon - A faunal comparison. Neues Jahrbuch für Geologie und Paläontologie, Abhandlungen 245(1): 59-69. Fuchs, D. 2009. Octobrachia - a diphyletic origin? Berliner Paläobiologische Abhandlungen 10: 182-192. Fuchs, D. (in press). A rare and unusual teudopseid coleoid from the Late Cretaceous of Hâqel (Lebanon). In: Fuchs, D., Weis, R. & Faber, A., eds., Proceedings of the 3rd International Symposium Coleoid Cephalopods Through Time. Luxembourg 2008. Ferrantia, Musée national d'histoire naturelle Luxemburg. Fuchs, D., Bracchi, G. & Weis, R. 2009. New records of octopods (Cephalopoda: Coleoidea) from the Late Cretaceous (Upper Cenomanian) of Hakel and Hadjoula (Lebanon). Paleontology 52(1): 56-81. Fuchs, D., Engeser, T., & Keupp, H. 2007a. Gladius shape variation in the genus Trachyteuthis Meyer 1846 (Cephalopoda: Coleoidea) from the Late Jurassic Plattenkalks of Nusplingen (Kimmeridgian) and Solnhofen (Tithonian). Acta Palaeontologica Polonica 52(3): 575-589. Fuchs, D., Keupp, H. & Engeser, T. 2003. New records of soft parts of Muensterella scutellaris MUENSTER, 1842 (Coleoidea) from the Late Jurassic Plattenkalks of Eichstätt and their significance for octobrachian relationships. Berliner Paläobiologische Abhandlungen 3: 101-111. Fuchs, D., Klinghammer, A., & Keupp, H. 2007b. Taxonomy, morphology and phylogeny of plesioteuthidid coleoids from the Upper Jurassic (Tithonian) Plattenkalks of Solnhofen. Neues Jahrbuch für Geologie und Paläontologie, Abhandlungen 245(2): 239-252. Fuchs, D. & Schultze, H.-P. 2008. Trachyteuthis covacevichi n. sp., a Late Jurassic coleoid cephalopod from the Paleopacific. Fossil Record 11(1): 39-49. Fuchs, D., Stinnesbeck, W., Ifrim, C., Giersch, S., Gutierrez, J.M.P. & Frey, E. (in press). Glyphiteuthis rhinophora n. sp., a trachyteuthidid (Coleoidea, Cephalopoda) from the Cenomanian (Late Cretaceous) of Mexico. Paläontologische Zeitschrift. Fuchs, D. & Weis, R. 2008. Taxonomy, morphology and phylogeny of Lower Jurassic loligosepiid coleoids (Cephalopoda). Neues Jahrbuch für Geologie und Paläontologie, Abhandlungen 249(1): 93-112. Fuchs, D. & Weis, R. 2009. A new Cenomanian (Late Cretaceous) coleoid (Cephalopoda) from Hâdjoula, Lebanon. Fossil Record 12(2): 175-181. Fuchs, D. & Weis, R. (in press). Taxonomy, morphology and phylogeny of Lower Jurassic teudopseid coleoids (Cephalopoda). Neues Jahrbuch für Geologie und Paläontologie. Haas, W. 2002. The evolutionary history of the eight-armed Coleoidea. Abhandlungen der Geologischen Bundesanstalt 57: 341-351. Jeletzky, J.A. 1966. Comparative morphology, phylogeny and classification of fossil Coleoidea. Paleontological contributions, University of Kansas Mollusca 7: 1-166. Naef, A. 1922 (2004). Fossil dibranchiate cephalopods. Berliner Paläobiologische Abhandlungen 5: 1-209 [Translated from German: original Title: Die Fossilen Tintenfische- Eine paläozoologische Monographie. - 322 p., Jena (G. Fischer)]. Toll, R.B. 1998. The Gladius in Teuthid Systematics: 55-67. In: Voss, N.A. et al., ed., Systematics and Biogeography of Cephalopods. Vol. II, Washington (Smithsonian Contributions to zoology). Vecchione, M., Young, R.E., Donovan, D.T. & Rodhouse, P.G. 1999. Reevaluation of coleoid cephalopod relationships based on modified arms in the Jurassic coleoid Mastigophora. Lethaia 32: 113-118. Young, J. Z. 1989. The angular acceleration receptor system of diverse cephalopods. Phil. Trans. R. Soc. Lond. B 325: 189-238. Young, R. E., M. Vecchione and D. Donovan. 1999. The evolution of coleoid cephalopods and their present biodiversity and ecology. South African Jour. Mar. Sci. 20:393–420. Page: Tree of Life Octopodiformes Berthold and Engeser, 1987. Vampire Squid and Octopods. Authored by Richard E. Young, Michael Vecchione, and Dirk Fuchs. The TEXT of this page is licensed under the Creative Commons Attribution-NonCommercial License - Version 3.0. Note that images and other media featured on this page are each governed by their own license, and they may or may not be available for reuse. Click on an image or a media link to access the media data window, which provides the relevant licensing information. For the general terms and conditions of ToL material reuse and redistribution, please see the Tree of Life Copyright Policies.